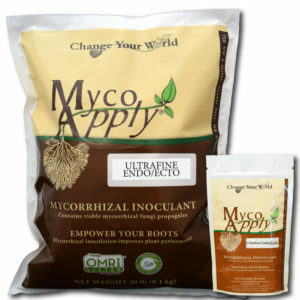 Mycorrhizal Applications (MA) has launched a new mycorrhizal inoculant product called MycoApply® Ultrafine Endo/Ecto. Developed to improve the soil for conifers, woody shrubs and other ornaments, the product features four species of endomycorrhizae and seven species of ectomycorrhizae. The fungi colonize on a plant’s root systems to increase the surface area, allowing it to absorb more nutrients and water. It can be incorporated directly into soil or growing media; suspended in water or liquid fertilizer and applied as a drench, spray, root dip, or plug tray dip; or applied directly to roots during transplanting or landscape outplanting. MycoApply Ultrafine Endo/Ecto can also be added to hydromulch or hydroseed slurries for use in restoration and erosion control projects. It was released on January 1, 2019 and can be purchased in 1- and 20-pound bags.